In the beginning, he published under the pseudonym Gregor Samsa. His books are written in a postmodern manner and topics are, at least for some people, immoral. In his novel "The Simpsons" he provides readers with famous cartoon heroes' opinion on homosexuality. In his other novel, he shows a disrespect and hatrede towards his own mother. His last novel, "The Inflatable Angel" (გასაბერი ანგელოზი), dealing with spiritism, became the book of the year 2011 in Georgia. His books were publicly burnt by religious activists because of scandalous topics they dealt with and language experiments. Burchuladzeho román Adibas, ktorého dej sa odohráva v Tbilisi v roku 2008, počas rusko-gruzínskeho konfliktu, vyšiel v roku 2011 v poľskom preklade. Tento román patrí medzi prvé dielo súčasného gruzínskeho autora, ktoré bolo preložené do poľštiny. Zaza Burchuladze will be one of the delegators on The London Book Fair 2015 which is being held from 14th April to the 16th April 2015. Оdkaz Здесь вы сможете прочитать антироман Зазы Булчуладзе, ´´Минеральный джаз´´ на русском языке. V Lipsku (22.10.) s v Berlíne (23.-24.10.) v divadle Maxima Gorkého sa koná festival OFFstimmen, na ktorom sa predstavia exiloví umelci v Nemecku. Medzi hosťami dnešného večera nebude chýbať ani gruzínsky autor Zaza Burchuladze, ktorý je obeťou prenasledovania vo svojej vlasti vďaka textom s obsahom tém náboženstva, násilia, či sexuality. This series published by Dalkey includes four novels newly translated from Georgian into English by some of Georgia’s best contemporary authors: Dagny by Zurab Karumidze, pondering such lofty subjects as religion, art, mysticism, and civilization; Journey to Karabakh by Aka Morchiladze, a Georgian best-seller and the basis of two films; The Literature Express by Lasha Bugadze, a parable of writers traveling by train across Europe; and Adibas by Zaza Burchuladze, called a “‘war novel’ without battle scenes,” depicting desolations of war and consumerism in Georgia. The game of "Summoning Spirits" is still quite popular in Georgia. During the game, the invoked spirit(s) gives signs to the players and confirms its presence. What will happen if one of the summoned spirits does not want to go back and decides to stay and live with the players? The new novel by Zaza Burchuladze narrates such a story. The summoned spirit in the book is a renowned mystic – George Gurdjieff; Gurdjieff's spirit is visible and highly communicative. Zaza Burchuladze graduated the monumental and ornamental painting department of Tbilisi State Academy of Arts. 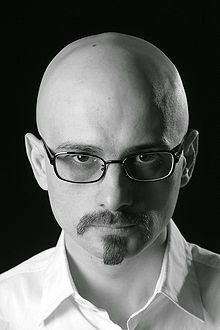 Since 1998 he has been publishing his stories in Georgian newspapers and magazines and has been a blogger for Radio Free Eorope/Radio Liberty (Georgia). Translated into Georgian books of Fyodor Dostoyevsky, Daniil Charms, Vladimir Sorokin. Zaza Burchuladze's books have been translated into English, German, French, Italian, Romanian and Russian.